A 20-year old toxic waste dumping ground 30 kilometers south of Yerevan has aroused concern among environmental activists who say residents of the area are in danger of exposure to DDT and other harmful chemicals. In 1982, 500 tons of waste and banned toxic chemicals were buried in the upper part of Artashat Region’s Bardzrashen village. Today the place is part of Erebuni Community. 500 tons of toxic waste in a region of landslide. Late last year and as recently as April, samples were taken from seven sources in the area. Upon examination by sanitation and epidemiology experts, four of the samples were found to contain harmful chemicals, and the level of toxins in the soil was higher the second test than the first. Attention is being drawn to the dump site by members of Armenian Women for Health and Healthy Environment, a Non Governmental Organization which first learned of the site four years ago. Members of the organization say that the site poses a threat because it is in an area susceptible to landslides. The women have written letters to various government ministries, requesting that the site be cleaned. The specialist says there are cracks in the earth’s surface in the area, proof that the land is shifting. No specific research has been conducted yet to determine if the nearby population has suffered any effects from exposure or consumption. The women’s group says it hopes to receive grant funding to conduct such research. 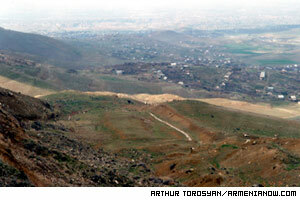 The nearest settlement to the dump, about 2.5 kilometers away, is the village of Geghadir, but some summer homes are only 800 meters from the site. The NGO renewed concerns about the toxic dump as part of its “Future Without Toxics” initiative, made possible by a grant from World Study Program. Over a period of seven months, it examined the site and took samples of soil at the beginning of the program and at the end. According to Simonyan, no toxic chemicals have been found in the soil around residences, but could reach homes through water. The tests found levels of DDT (dichlorodiphenyltrichloroethane), as well as hexachlorophene (an anti-bacterial chemical). Specialists say the chemicals can remain vital in soil for 40 years. Ingestion of chemicals such as DDT, have been known to damage human immune and neurological systems, and are especially hazardous to reproductive organs. Yadoyan says evidence from the NGO research indicates that preventative measures should be taken to avoid health risks. The Department of Emergency Situations specialist is not alarmed. He says the DES has not had experience with waste removal and is not sure what measures should be taken. There are no records on file of the burial, thus, no starting point on how to go about a cleanup. On April 24 the Government of Armenia adopted a decision on protective measures for toxic wastes sites. It approved 8.5 million drams (about $16,000) to be spent on efforts to make the area safe and plans to hold a tenure for bids from companies that could clean the site. Yadoyan says today there are 3,500 landslide zones in the republic and 300 of them are actively researched.